The photos in the fly fishing gear catalog of a fly fisher casually landing a big trout are not always accurate. Case in point...during a day on the Gunnison River this summer, I hooked a nice big Rainbow on a size 18 dry fly. The water was clear, and when I saw the size of the trout, my heart started to race, and I quickly tried to recall how carefully I had tied the knot from tippet to fly. In the process of landing the trout in shallow water, I fell. Landing on my net, and breaking it. It must have been quite a sight to the casual observer as I flailed about and gyrated, protecting my rod and the trout. After releasing the trout, I assessed the damage. I shoved what was left of the net into my wading belt, and noted that my knee was a bit tender. As I waded back into the water to cast again, I felt water soaking my sock. Upon closer inspection, I found a decent size gash in the knee of my Simms G3 waders. The G3 is a tough wader...I have fallen numerous times in the past with no issues, but this time, I was not so lucky. It was still early in the day, with much fishing to do, and I didn't have any spare waders on the week long trip. I walked back to to the truck, and started digging through my Fishpond gear bag in hopes of finding something to get me back onto the water. Years ago I had purchased a tube of Loon Outdoors UV Wader Repair, and fortunately, it was in my bag. The only time I had ever used it was to assist my friend Cameron Mortenson (thefiberglassmanifesto.com) after he tore his waders on a barbed wire fence in Montana. During that incident, we were miles away from any store, and we found that this quickly repaired his waders. I was convinced then of the quality of this product, but fortunately had never needed it for myself. Using this product was very simple. I brushed dirt away from the tear, and moved the waders into the shade. I applied a thin film over the tear, then moved the waders into the sunshine. The product then quickly formed a thin, flexible seal over the tear. That's it! I fished for the rest of the trip (fly fishing from sunrise to sunset), with no issues. The seal held great, and no water leaked into the waders. I have fished with the waders quite a few times since the repair with no issues. I'm sure that Simms would love to sell me a new pair of waders, but there is plenty of life left in these G3's, and the minimal cost of the UV wader repair has allowed me to enjoy my favorite waders for a while longer. I highly recommend keeping a tube of this product in your gear bag. 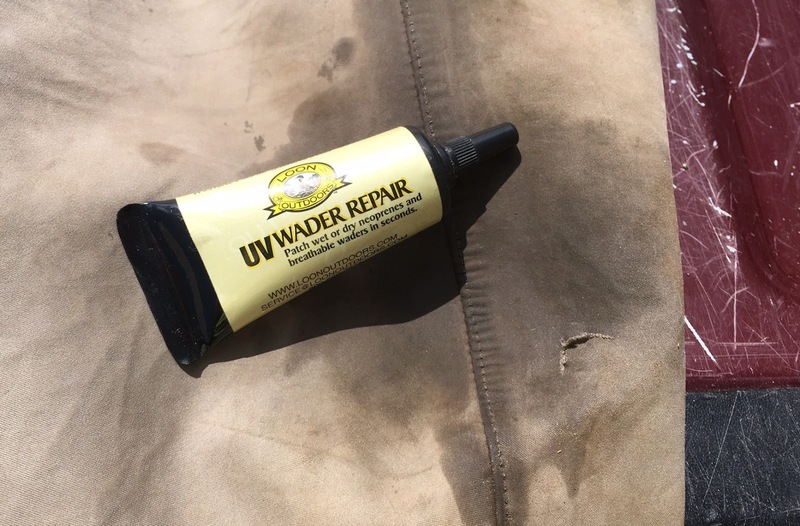 The Loon Outdoors UV Wader Repair earns Dry Fly status.